Established by Council Member Melissa Mark-Viverito, the El Barrio/East Harlem Youth Violence Task Force is a collaborative dedicated to addressing the rise in youth violence in East Harlem, through progressive strategies that will engage and empower local young people. The Task Force, which is comprised of youth organizations and other community leaders, aims to directly involve young people in the development of positive alternatives that will counter the increase in violence among youth. The Task Force is a collaborative initiative of the office of Council MemberMelissa Mark-Viverito, Art for Change, Barrio Media, Children’s Aid Society, City Year, Community Board 11, Council for Unity, Downtown Community Television Center, East Harlem Tutorial Program, Harlem Community Justice Center, Harlem RBI, New York Academy of Medicine, Peace on the Streets, SCAN, Steps to End Family Violence/R.A.P.P., Transform America, Union Settlement, Urban Dove and Youth Action Programs and Homes, Inc.
Much progress has been made since Council Member Melissa Mark-Viverito convened the El Barrio/ East Harlem Youth Violence Task Force last year, a collaborative dedicated to addressing the rise in youth violence in East Harlem through progressive strategies that will engage and empower local young people. Since June of last year the task force has hosted three public community discussions, where we heard directly from about 200 youth and residents, who identified a number of key issues such as a lack of jobs and youth/ recreation programs, extracurricular and sports activities. They also discussed the problem of easy access to weapons, a “culture of violence” and the peer pressure kids face to join gangs, police harassment and brutality, a lack of male role models, and poor communication between parents and children. In addition to asking the community what they felt contributed to violence we also asked that they think of solutions to the issues. Recommendations included increased investment in jobs and youth programs, more advertisement of existing programs and community centers, street outreach violence intervention programs with peer mentoring (such as the violence interrupters model), gun buy-back programs, more respectful policing, and increased parent involvement and parenting classes. The Task Force will be releasing a policy platform with the community’s recommendations during the 5th Annual Teen Fair at the end of the summer. 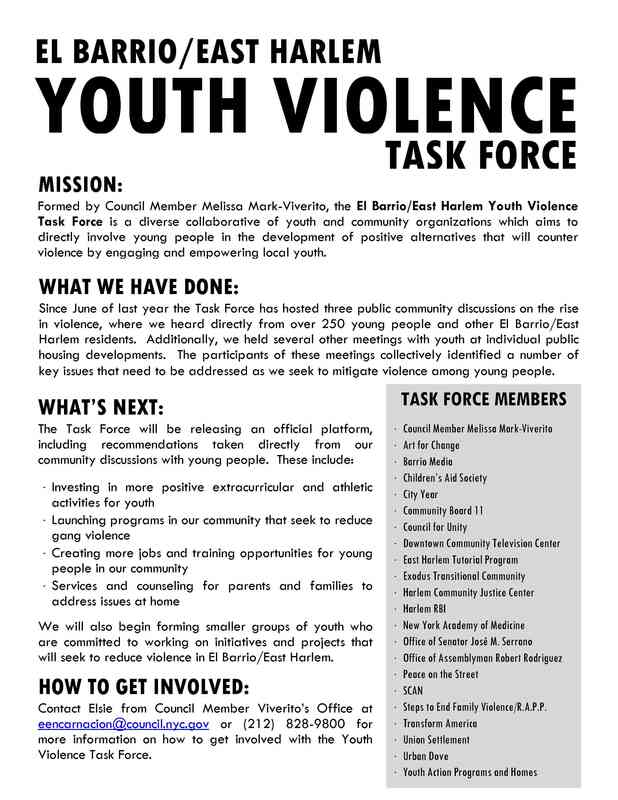 For more information on how to get involved in the El Barrio/East Harlem Youth Violence Task Force, please contact Andrew King at aking@council.nyc.gov. Take a look at the comments section below for recent posts on the blog regarding the work of the Task Force. I think applaud your movement for greater involvement in Youth activies, to help young people cope with today’s ever increasing tragic economic and social services decline. While I saw politicians and community leaders come together at the same time you must include the police to pass along relevant data and assistance in Juvenile Justice. Numerous studies and programs have been started to study and prevent the youth of a community from turning to crime and drugs. I urge you to see what kinds of programs might be available for Youth Criminal and Drug Prevention – John Jay College of criminal Justice has been a big participant in the past. Contact President Travis and seek out his help. The federal authorities are big participants with their OJJDP – Office of Juvenile Justice and Drug Prevention Programs from the DOJ – Department of Justice.